Debuting in March 2017, Celebrity Xperience will offer cruises to the incredible Galapagos. 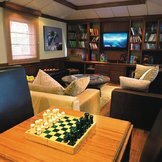 Accommodating only 48 lucky explorers, this intimate ship features comfortable all-oceanview staterooms, a dining room as well as al fresco dining, lounge and bar, a library, and Sun Deck complete with shade canopy, comfy lounge chairs, a Jacuzzi, and even two exercise bikes. 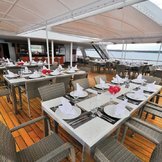 Offering a wealth of amenities and creature comforts plus the expertise of Galapagos National Park certified onboard naturalists, a cruise aboard Celebrity Xperience is the perfect way to explore one of the world's most amazing pristine wonders. 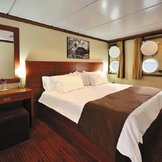 12 cabins and 3 cabin categories.